Where exactly is that grave in Israel? The government of Israel has a well-deserved reputation for centralization, but in some areas, things operate strictly locally. Burials, a government-funded service, is one of these. There is no way too look up a burial in Israel without knowing where the person is buried. So you are pretty much on your own regarding locating a grave. But there are resources available, even online. The Hevra Kadisha (burial society) of Tel Aviv-Yafo has an excellent website for the six cemeteries under its jurisdiction. This society handles burials for twenty-one cities and communities, including some like El'ad, Shoham and Elkana, which are fairly distant. Haifa too is online, and its website has been upgraded significanty in the past few years. Haifa has much more detail that Tel-Aviv, but unlike Tel-Aviv, it serves only Haifa itself, not the nearby communities. 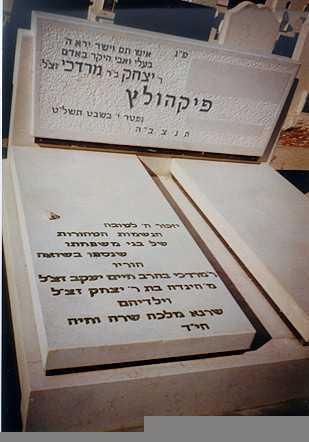 The JewishGen Online Worldwide Burial Registry (JOWBR) includes nearly two dozen Israeli cemeteries, including at least one each in Ashkelon, Kefar Sava, Petah Tiqva, Rishon LeZion, Zefat, Rehovoth, Netanya and Nes Ziona. A few other local cemeteries are online, including Petah Tiqva. I have put the entire Hevron cemetery online here. A fairly new resource can be fund at http://www.kadishanet.co.il/search_BuriedPlace.asp which supposedly allows searches of many cemeteries, but one at a time and only for specified names, with precise spellings. I give it mixed reviews. Conspicuously absent from this survey thusfar is Jerusalem, which is not only not online, but is also divided among many different burial societies, each with its own records and each represented at one or more of the city's cemeteries. An effort is being made to put the Mt. of Olives online including some photographs, but the results thusfar are far from satisfactory. There are also many cemeteries in smaller towns and on agricultural settlements, as well as private cemeteries in Benei Berak, Ashkelon and elsewhere. As in most communities, older graves can be hard to read and that adds to the challenge. In Jerusalem, many older graves have no surnames. In general, most names are only in Hebrew letters. And dates are often only according to the Jewish calendar. The stone to the right is an example of information that may not be available anywhere else. The basic information on Yitzhak Pikholz appears at the top, as usual. The inscription at the bottom is in memory of his parents, brother and sisters who were killed in the Holocaust. Yitzhak's parents are mentioned with their fathers' names and this reference to his paternal grandfather is the first time I had ever seen the name of that particular Pikholz man. Needless to say, without actually visiting the grave or seeing a good photograph, we would never have known about this inscription. For further information, including the possibility of my visiting graves on yahrzeits on behalf of family abroad, contact Israel Pickholtz, Solutions.